Thanksgiving is coming this week, so I included a separate shopping list, and this is assuming you already have your turkey and gravy. I kept it separate for those of you who may not be cooking this Thanksgiving. Just discovered your Meal Plans. How wonderful and thank you so much! I intend to try them out starting this weekend. I just discovered your meal plans a week ago, and it was exactly what I needed during this hectic time of year when it’s all too easy to eat irresponsibly with holiday treats and fast food at the mall. I’m impressed with the ease that it all comes together, and I’m so grateful I’ve found this website. Thank you, thank you, a million times, thank you. Love your recipes and meal plans. Please keep posting! I would be lost without them. 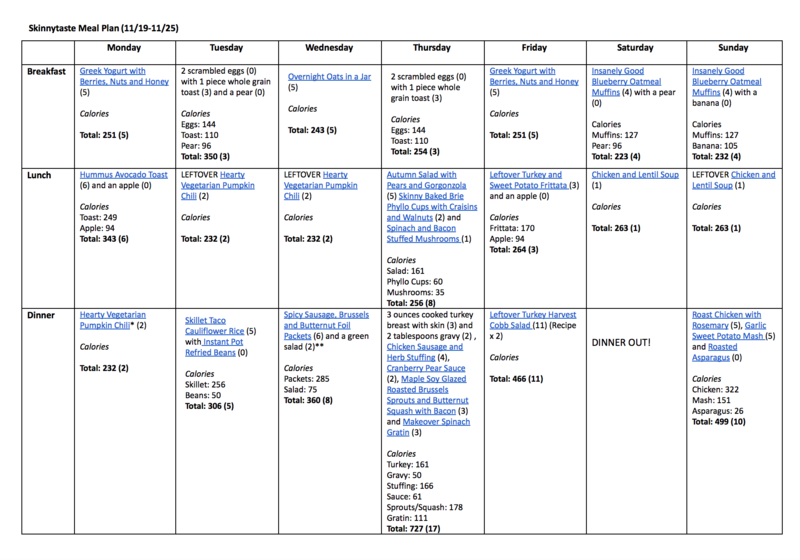 So this will be my first week that I will be doing your meal plan. I am super excited as your recipes look fantastic and so easy to prepare. I live in South Africa and Turkey is not readily available here. Can I replace Turkey with Chicken? 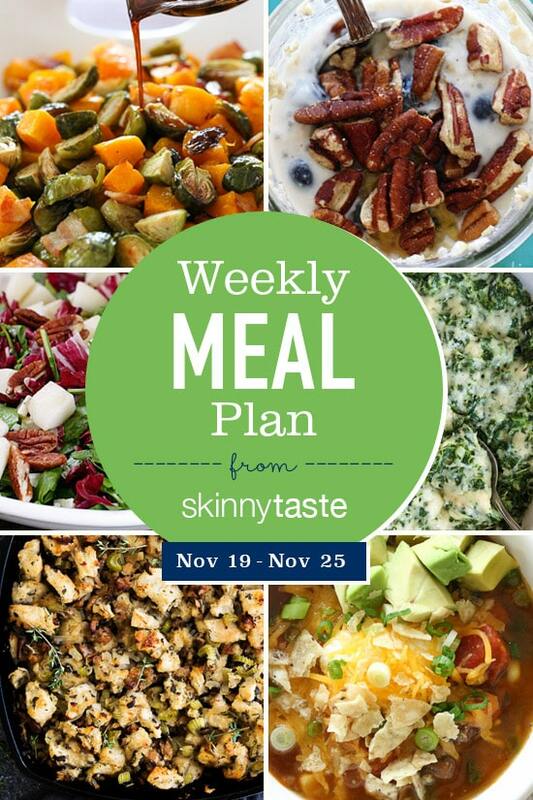 Thank you SO much for sharing these meal plans every week. I count on them fully to not get bored with my meal planning and try new things! Everything I’ve made has been DELICIOUS! I have all of your cookbooks as well. I appreciate you!! Thank you for the meal plans. I have been doing WW since July and have lost 25 pounds. Lately I have been having trouble sticking with it. These meal plans give me new ideas for meals and are so points friendly. Thank you again and please keep posting. Hi Gina! I don’t know what I would do without your weekly plan and recipes. It makes life so easy because my family and I enjoy the delicious food. Please continue to share. I am also using your latest cookbook, Skinny Taste One and Done. Thank you! Hi GINA, I started using your meal planner and recipes on October 1 and have lost 9 pounds! I’m also enjoying doing “real” cooking. All your recipes are soooooo flavorful and I’m loving using the fresh herbs. Thank you for providing this amazing service. ? First of all thank you for this meal planners awesome 🙂 Lunch on Friday doesn’t seem to be a leftover from any previous meal. Doesn’t matter but I thought you should know. I think it’s the turkey that’s leftover and going into the Frittata. I love these plans as they are great to get ideas from. Please keep sharing.